I have a special Valentine’s Day treat for you today! 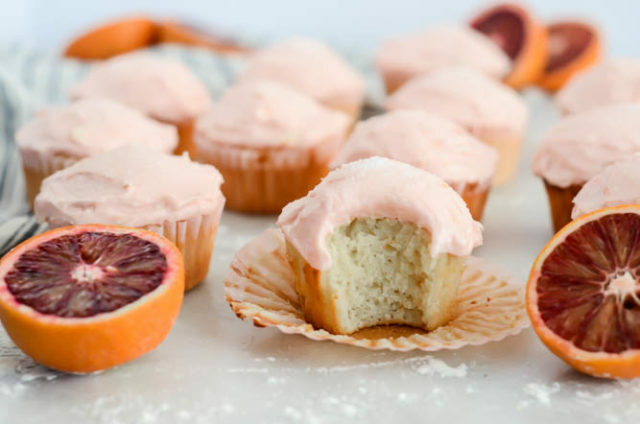 These One-Bowl Boozy Blood Orange Cupcakes are just what any busy mom or partner needs this week – they’re super easy yet incredibly decadent. 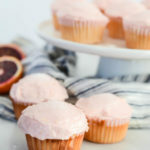 The cupcakes are laced with blood orange, orange liqueur and olive oil and topped with a luxurious (and not too sweet) boozy blood orange-cream cheese frosting. 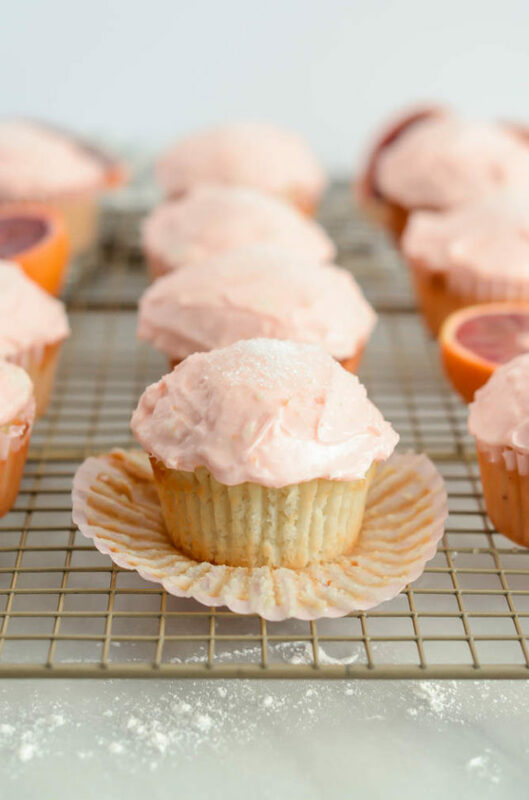 Quite honestly, they are my ideal cupcake – with all the fresh citrus flavors and a density that can’t be beat. Plus, there’s the booze. We all know how I’m a big fan of the booze! When I saw a big bag of blood oranges at my local Trader Joe’s recently, I just had to get them. They are, after all, one of my favorite winter treats. I’ve been loading up on oranges lately to get as much natural Vitamin C into my bod as possible, and the blood oranges arrived at just the right time for me to mix up my routine a bit. I just couldn’t pass up the opportunity to make a vibrantly colored sweet treat with some of these bright red beauties, and just in time for Valentine’s Day! Tell me, do you already have big plans or are you keeping things low key? Are you a fan of celebrating this Hallmark holiday or do you prefer professing your love for your significant other all year round? Really, as long as you can get a hold of a big bunch of blood oranges, you’re in good shape. In fact, I’d venture to guess you already have most of the other ingredients on hand in your refrigerator or pantry already. Once you have all of the ingredients (which, by the way, are easily measured out using only a couple sizes of dry measuring cups and using up just two entire blood oranges – zest and juice), just throw everything into the bowl of your stand mixer and let it do all the work. I also love that you can easily make the cupcakes one day and the frosting the next because, if you’re a mama or busy woman like me, you never know how much time you’ll have to accomplish a task! I made the cupcakes the night before, then whipped up the frosting the next morning…I would also like to point out that I frosted and decorated the cupcakes and subsequently had to refrigerate them for a few hours until I had a chance to photograph them, so these bad boys really do hold up well with a little sit time. 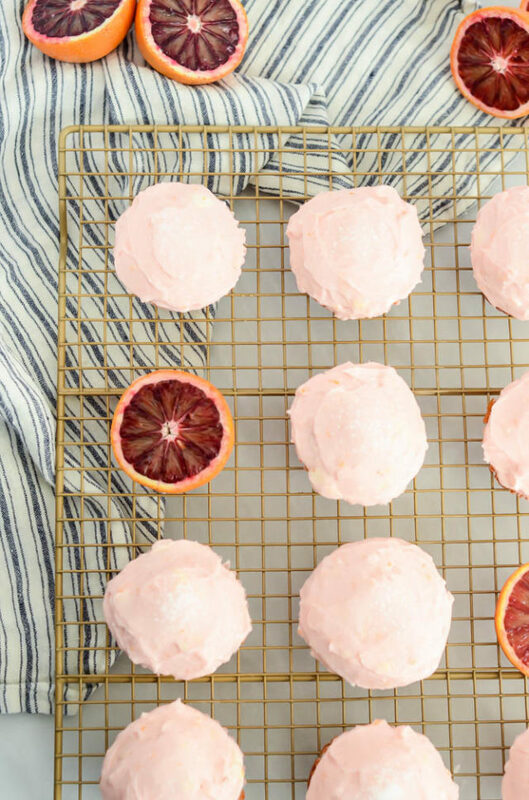 Whether you have a special someone you want to make something for this Valentine’s Day or just want a tasty treat you can whip up with the season’s most colorful citrus, these One-Bowl Boozy Blood Orange Cupcakes are for you. The recipe yields a dozen and a half, so you’ll have plenty to share! 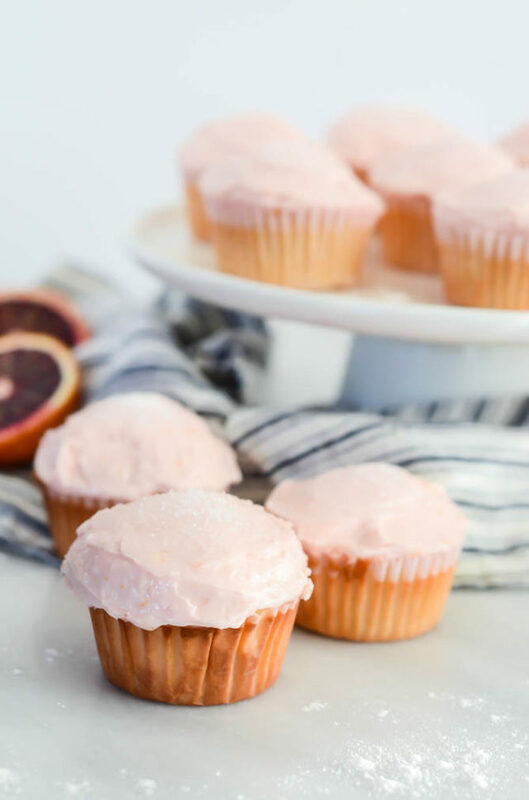 These cupcakes are incredibly moist with a big hit of citrus and a perfectly pink cream cheese frosting - the perfect treat for a special someone! Preheat oven to 350 degrees Fahrenheit and line cupcake tins with paper or spray with nonstick cooking spray. Combine all cupcake ingredients in the bowl of a stand mixer and mix - using the paddle attachment - until combined, about 3 minutes. Fill cupcake tins ¾ full with batter. Bake in 350 degree oven for 24-26 minutes, or until a cake tester inserted into the center comes out clean. Let cool for 5 minutes in tins, then remove from pan and let cool completely on a wire rack. To make the frosting, combine all frosting ingredients (except food coloring) in the bowl of a stand mixer fitted with the paddle attachment. Once all ingredients are combined and creamy, add food coloring and mix until desired color is reached. Transfer frosting into a piping bag and cut off the tip. Pipe a generous amount of frosting onto each cupcake, but it doesn’t have to be pretty. Once all cupcakes are topped, use a small butler’s knife or spatula to neatly spread the frosting over the top. Sprinkle white sanding sugar over top. Store in covered container in refrigerator for up to 4 days. *You will have extra frosting to spread on graham crackers, more cupcakes, a loaf cake, etc. 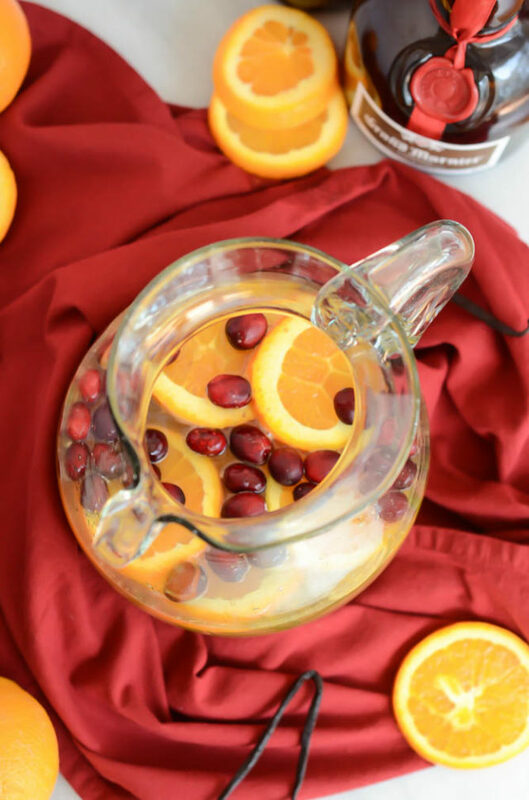 Because every holiday season needs a delicious punch recipe! I mean, am I right? We are, after all, in the season of entertaining, and nobody wants to spend their entire dinner party mixing up individual cocktails for every single guest. 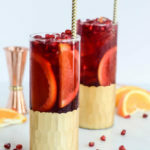 Nope, you need a delicious batch cocktail recipe that is festive, features some of the best flavors of the season and is super easy to throw together. 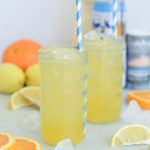 Well, my friends, I’m here to tell you that this Sparkling Citrus Vanilla Punch is the answer! If you know me, you know that I’m a hard-core sparkling wine lover. In fact, if I had to choose just one type of alcoholic beverage to enjoy for the rest of my life, it would be bubbles. There are so many different varieties, from dry to sweet, pink to star-bright, incredibly effervescent to just a light spritz. I love them all (enjoyed in the appropriate time and place) and ESPECIALLY enjoy them at this festive time of year. Doesn’t everyone? Which is exactly why I decided to use sparkling wine as the base for this uber-tasty Sparkling Citrus Vanilla Punch. 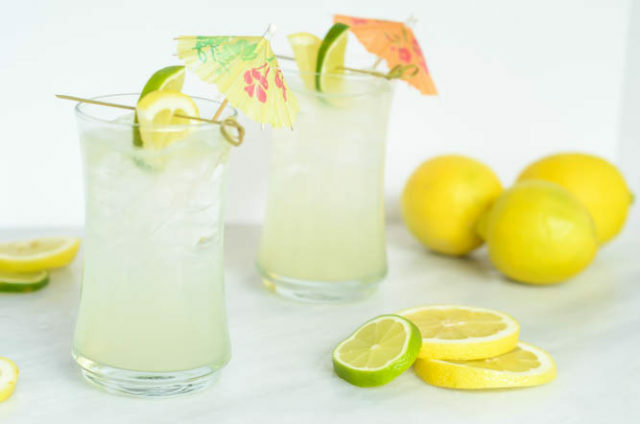 It lends the perfect celebratory touch to the other flavors of orange, lemon and vanilla, and has the added bonus of not being sooo high octane that your party guests will have one glass and end up needing to call a cab home. It’s the perfect drink for a crowd and comes together with no fancy bar tools or ingredients. 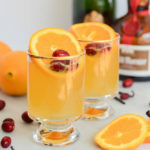 My kind of holiday cocktail! As far as what type of sparkling wine to use, feel free to use your own creative license here based on your personal tastes. I opted for a medium-quality dry cava (Segura Viudas to be exact) because that just happens to be our “house” sparkling wine. (Yes, we have one. Hey, my husband’s in the liquor industry!) I also don’t like my drinks too sweet, but if you’re entertaining a more sweet wine-loving crowd, by all means go for something with a little residual sugar to it. Fresh orange and lemon juice, both of which should be incredibly easy to obtain, especially at this time of year. Grand Marnier to add a little extra kick. And last, but not least, some vanilla extract! 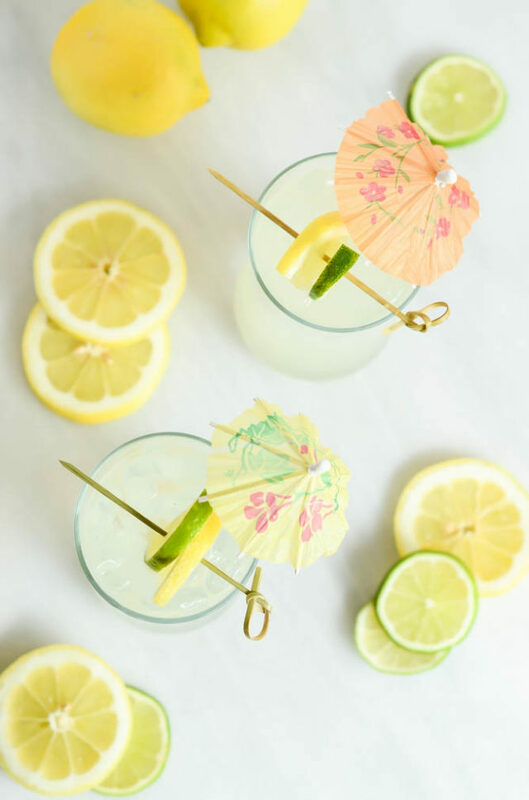 You’ll want to make sure your sparkling wine and citrus juices are chilled ahead of time, but when it comes time for your guests to arrive, you’ll literally need less than 5 minutes and a tall pitcher or punch bowl to throw this Sparkling Citrus Vanilla Punch together. I don’t know about you, but that’s my kind of party recipe! Cheers to a wonderful holiday weekend! 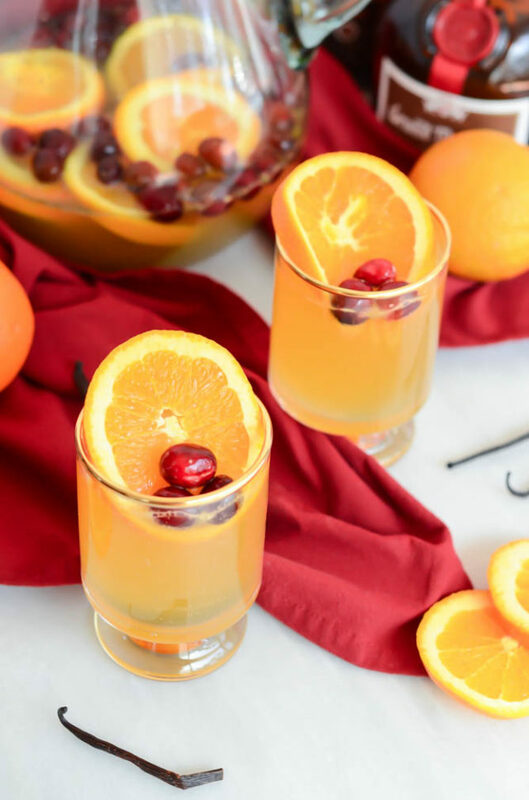 A fun, festive punch recipe featuring the best winter flavors including lemon, orange and vanilla. Perfect for your next get-together! Garnish with orange and lemon wheels and enjoy! Thirst quenching to the max! To be completely transparent here, I’ve started writing these posts a bit in advance since our little girl could be making her entrance into the world any day now. 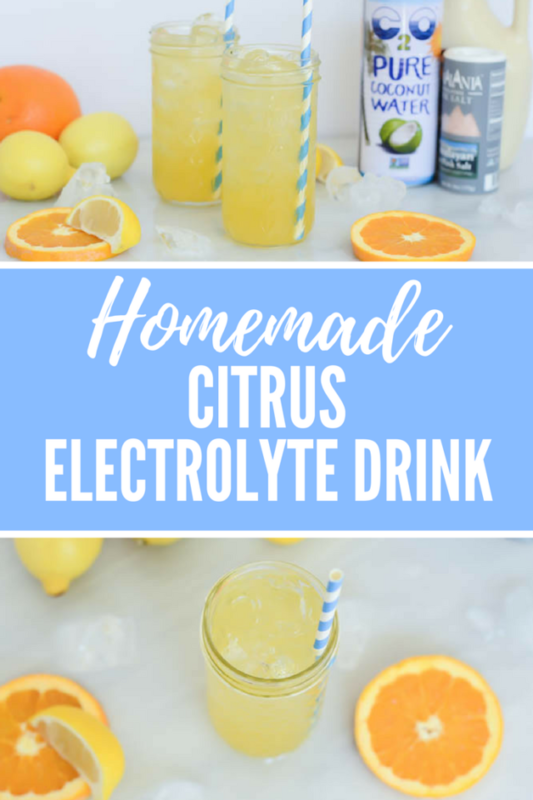 I came up with this Homemade Citrus Electrolyte Drink recipe in the hopes that I could have some on hand when I start going into labor. (My days of overly sweetened Gatorade are behind me.) For the latest updates on whether Baby D has arrived yet, be sure to follow me on Instagram and Facebook! But seriously, I’m really excited to share this recipe with you, and even more excited to have a hydrating Homemade Citrus Electrolyte Drink recipe in my back pocket for when I can finally get back to working out at my normal (fairly high) intensity, or even when I just need to replenish after a higher-than-normal level of partying or a long day of travel. Staying hydrated hadn’t always been really important to me, but when I was spending almost every waking hour during high school playing volleyball, I learned firsthand what a difference a drink with some electrolytes and potassium can make in performance and recovery. I think it was my freshman year the first time I experienced extreme dehydration. It was a couple of hours after I had gotten home from a long day of volleyball, and all of a sudden a horrific migraine came on…My eyesight was blurry, I had a horrible headache, and any light or noise just made everything ten times worse. Oh, and the nausea…It was INTENSE. It got so bad that I threw up and the only thing that seemed to make me feel better (aside from laying in a dark, quiet room with my eyes closed for a few hours) was a big jug of cold Gatorade. I quickly learned that, due to the amount of sweat I was losing during training, I needed to be replenishing my body with more than just straight water DURING these times. I started bringing Gatorade with me to every practice and game, and made sure I sipped on it continuously throughout. Although the dehydration migraines have happened to me a few more times since then, it really is a one-off and I can usually pinpoint why they happened after they do. Of course, the peak of my athletic days (high school and college, more than 10 years ago) were way before trendy coconut water made its way onto the scene, and I am very happy to now have that as a more natural rehydration option as opposed to artificially sweetened (and colored) Gatorade. Coconut water is now my go-to when I’ve been through an intense workout or feel the need to fill my body with all the good electrolytes and potassium. 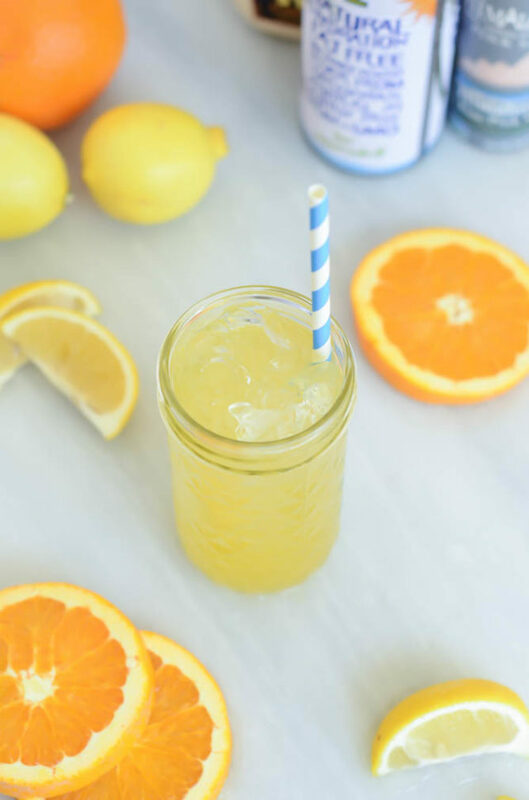 This Homemade Citrus Electrolyte Drink does indeed contain coconut water, but there are a few other ingredients that make it extra-special and hydrating, namely citrus juice, Himalayan pink sea salt and some maple syrup for a touch of natural sweetness. 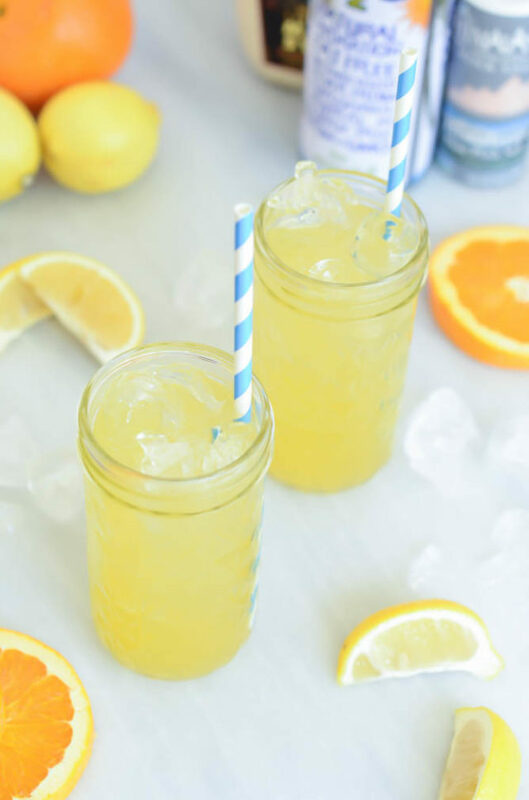 As you can see, not only is this Homemade Citrus Electrolyte Drink perfect for athletes/workout enthusiasts, it’s also going to be a godsend for me as I go through this crazy thing called labor. It also comes together quickly and can be stored in the refrigerator for at least a few days, so you can prep it and have it on hand at a moment’s notice! I’m not gonna lie, I’m pretty excited to have this to sip on during labor and throughout my recovery. It’s such a better alternative than sports drinks and I’m all about getting back on my feet (and in the gym) as soon as I’m medically cleared to do so. Tell me, do you have any tips for rehydration and/or making it through labor? I’m all ears! This homemade version of a replenishing sports drink has tons of health benefits and way fewer artificial sugars than any store-bought version. Combine all ingredients in a Mason jar (with a lid) and shake to combine. It’s been far too long since I’ve brought out the ‘booch. Don’t get me wrong, I’m still as in love with it as ever, but I was told by my OB that I should be careful about consuming kombucha while pregnant (which is slightly odd seeing as I have other friends whose docs told them it was good for them) but I just couldn’t help myself with this Citrus, Pomegranate and Cherry Kombucha Punch! When you can’t consume alcohol, you’ve got to get creative with how you enjoy your festive beverages. 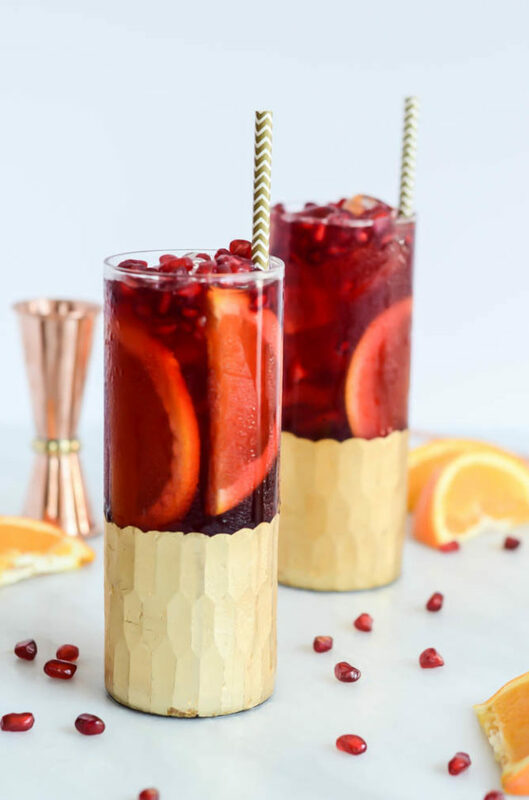 As a die-hard bubbles lover, I’m the first to use a delicious sparkling wine as my punch base when I’m not pregnant (case in point: this Sparkling Pomegranate Party Punch I made last year) so naturally I was looking for something that would be a suitable substitute, at least for the next 5 weeks or so. Because these days I seem to be getting “sugar headaches” if I consume too much overly sweetened juice, I wanted something that had minimal added sugar. I also wanted some bubbles – because we’ve got to keep things festive somehow! A citrus-y kombucha seemed just the answer. I decided to keep with the new season (hello, fall!) by using some of its star produce. While cherries may be on their way out, pomegranates are most certainly on their way in, as are all the citrus fruits. 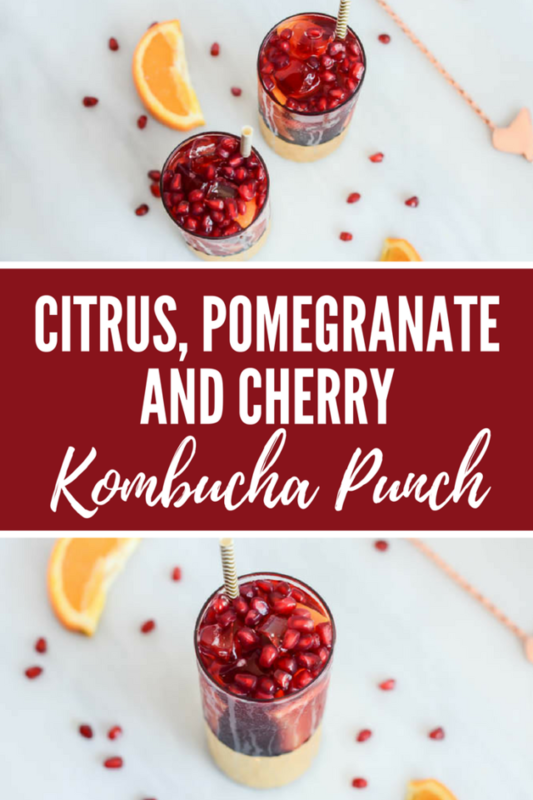 So into my base of citrus kombucha went equal parts pomegranate and cherry juices (which you can find at any Trader Joe’s) and then, to keep my Citrus, Pomegranate and Cherry Kombucha Punch not too basic, I added just a touch of orgeat to add a little extra dimension of flavor. 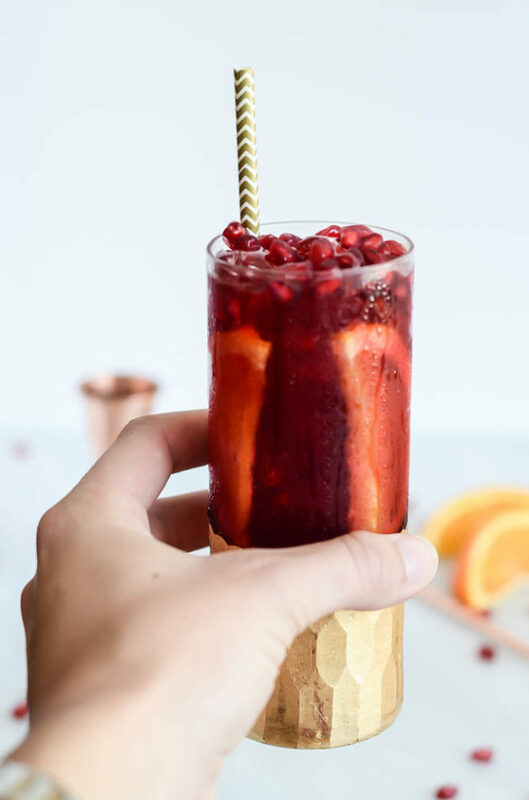 Once you have all the ingredients on hand, your Citrus, Pomegranate and Cherry Kombucha Punch will come together in a snap, which means it’s the perfect batch mocktail to whip up this weekend. Speaking of which, what are your plans? We have a few birthday parties to attend, but otherwise we’ll be relaxing, watching football, putting together baby stuff and packing our “go” bags for the hospital! 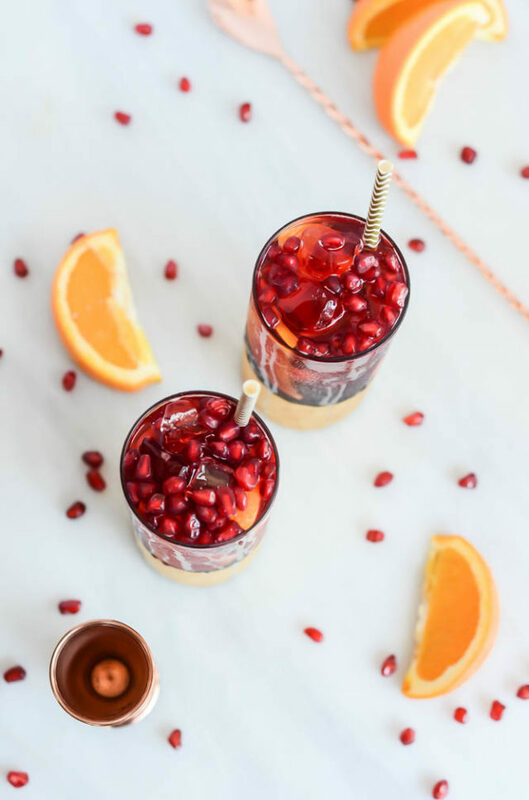 No matter what mischief you’re getting into, I hope you make this Citrus, Pomegranate and Cherry Kombucha Punch a part of it! 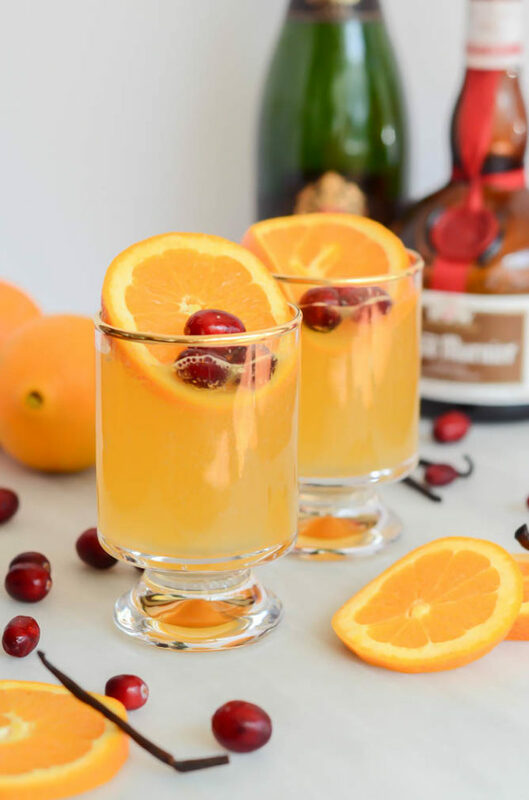 This festive punch is full of seasonal flavor and gets a non-alcoholic kick from citrus kombucha. The perfect drink for children and adults alike! Fill a tallboy glass with ice. Add kombucha, pomegranate juice, cherry juice and orgeat and give a little stir. Garnish with orange wedges or wheels and enjoy! The perfect way to get ready for the weekend! It’s no secret that I love alllllll the tropical flavors. I mean, just take a quick glance through my Recipe Index and you’ll find everything from this Belizean Rum Punch to this Li Hing Pineapple Margarita. 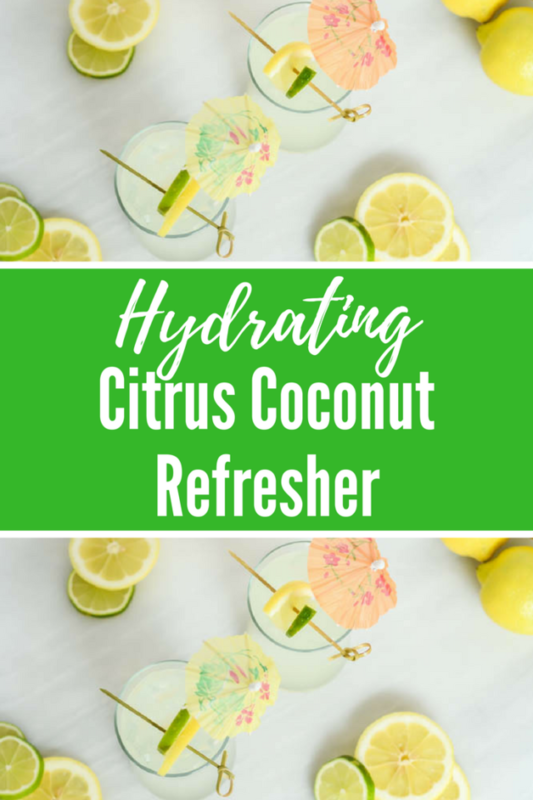 And now that it’s (almost) officially summer, they’re just going to keep on coming starting with this Hydrating Citrus Coconut Refresher! 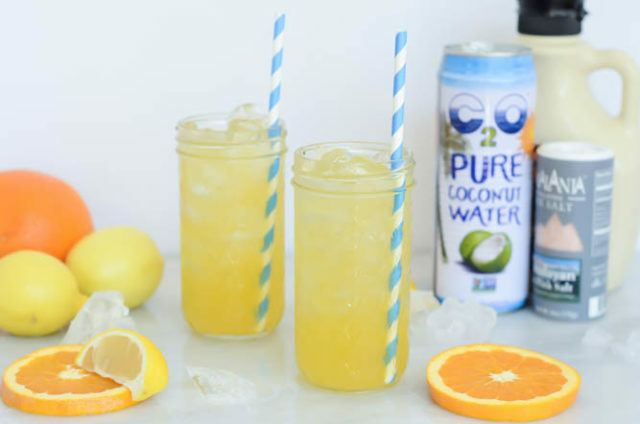 But before I get to my new fave Hydrating Citrus Coconut Refresher, tell me, what fun things are you up to this weekend? I, for one, am really looking forward to relaxing and just getting my head on straight. I recently took a part-time copyrighting job for a beverage company and it has definitely been keeping me busy. I’ve been working 14-hour days (between the blog and this new gig,) waking up early and going to bed a little later than usual for this preggo mama. I’ve just gotten the bulk of a big project out of the way, though, so I’m looking forward to regrouping, maybe heading to the beach, and just getting some extra sleep over the next couple of days! 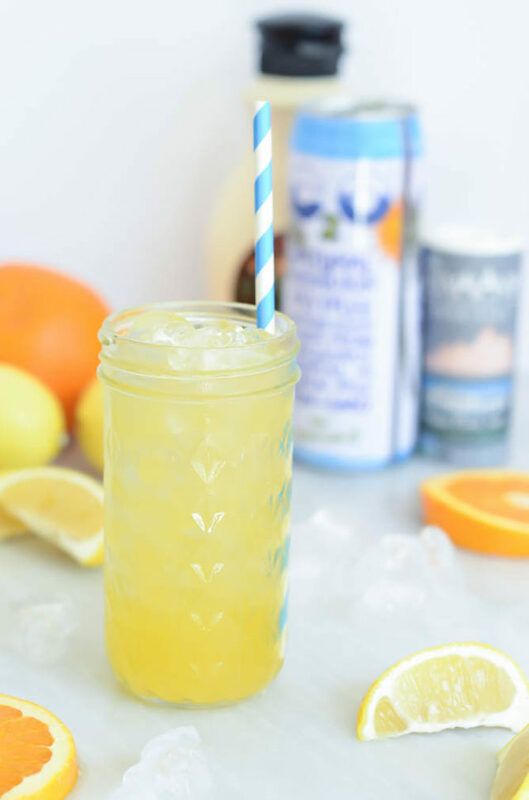 The lemon and lime juices are giving me (and baby) an extra dose of Vitamin C, while the coconut water and club soda make the drink incredibly hydrating. So there’s definitely no need for me to feel guilty when I’m sipping one of these and relaxing on a sunny beach this weekend! 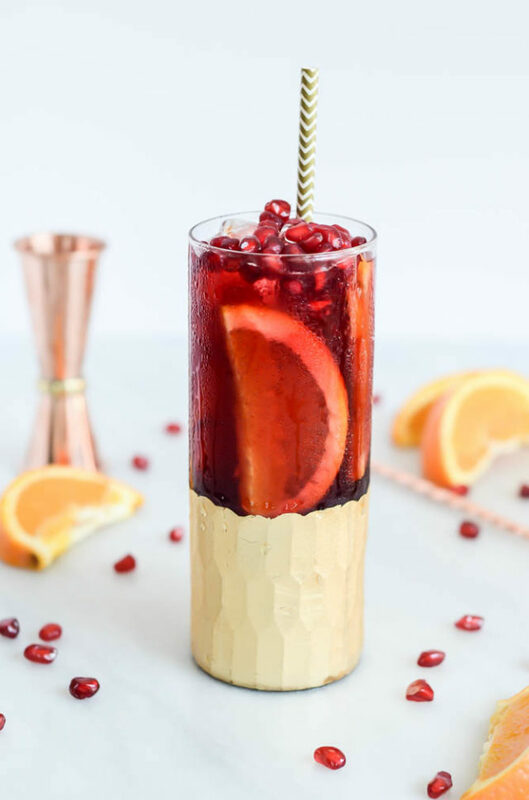 The other great thing about this mocktail is that, if you’re anything like me, you probably already have just all of these ingredients on hand in your pantry or refrigerator. And if you aren’t well-stocked with bar accessories like simple syrup, just throw some water and sugar together in a pot to boil and simmer down and you’ll have a homemade batch ready in no time. And for those of you who are still able to imbibe, I’d highly recommend either vodka or gin as the spirit of choice to spike these bad boys. I am personally more of a fan of gin because of its floral notes, but I also know there are a lot of you out there who would much rather go the less flavor-forward vodka route. 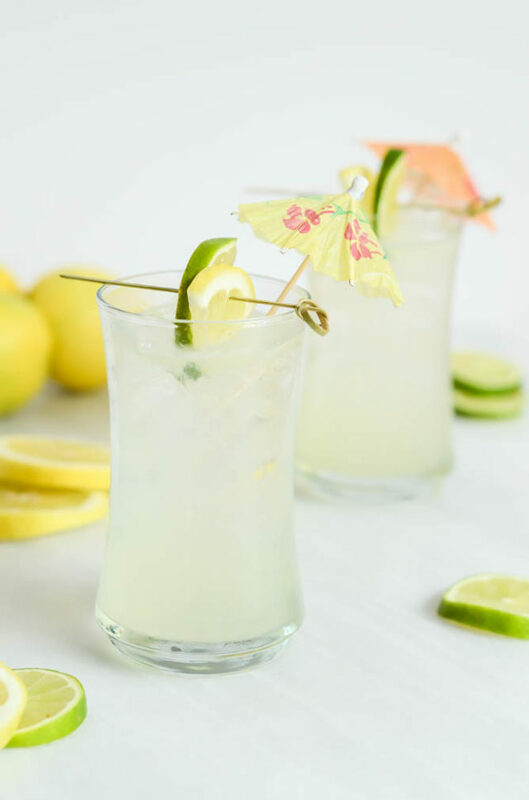 I’m keeping it fairly short today because there are a lot of tasks I still need to complete before kicking off my weekend with a Hydrating Citrus Coconut Refresher, but enjoy your Friday and, if you can, enjoy a spiked version or two for me! 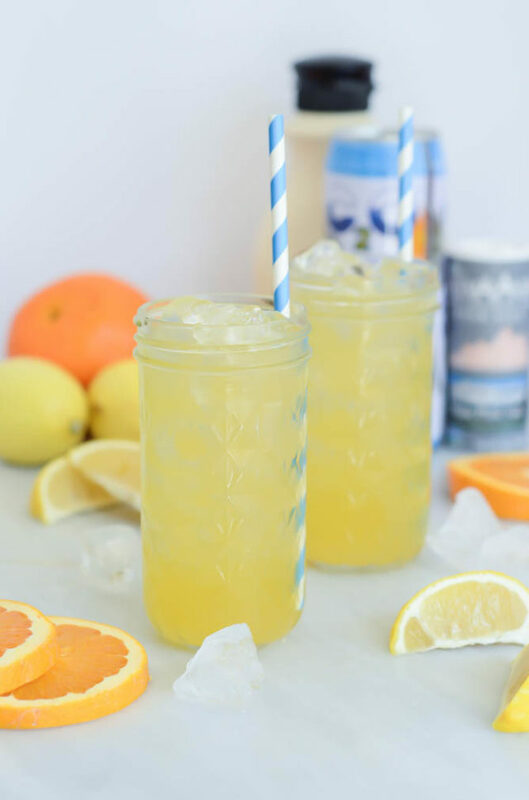 The perfect, healthy mocktail for summer featuring two types of fresh citrus, hydrating coconut water and fizzy club soda. Make it boozy with vodka or gin! Combine all the ingredients except the club soda in a cocktail shaker filled ¾ full with ice. 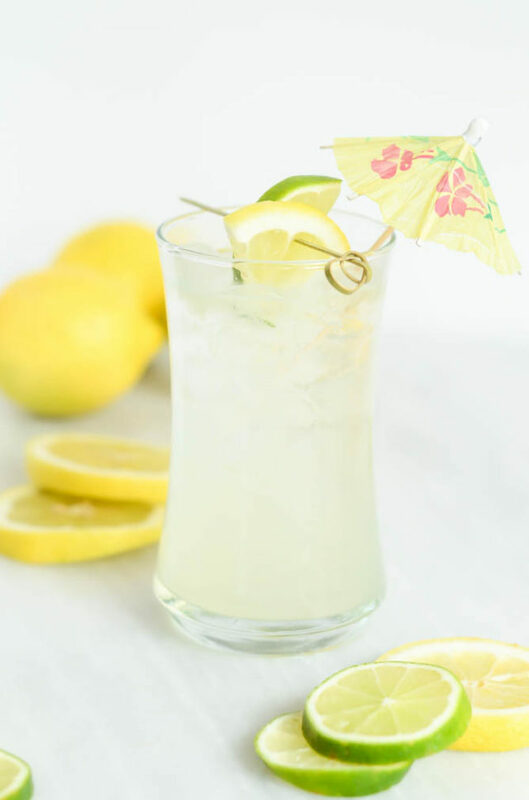 Shake vigorously for 10-20 seconds and then strain into a highball glass filled with fresh ice. 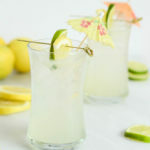 Top with club soda and garnish with a lemon and lime wedge threaded onto a cocktail pick.